I grew up eating Uncle Ben's & Minute Rice. Quick, easy and tasty. 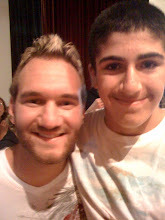 Then I went off to WSU and met Omid. Omid introduced me to Persian Rice. Wow. 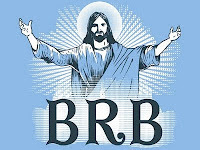 I have never gone back to Uncle Ben's or Minute Rice. 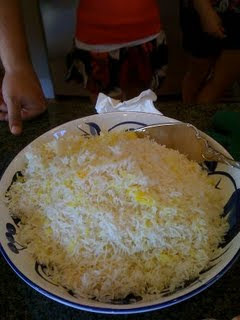 Persians and other Middle Eastern cultures usually have rice with every meal. We eat it several times a week ourselves. The recipe below is for plain, white rice. 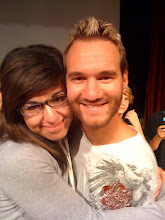 *Note: While this is labor-intensive, it is worth it! The deliciously fragrant scent the rice will fill your home with is just one of the rewards. The taste of Persian rice is something that cannot be described. Try this recipe...you will be glad you did! 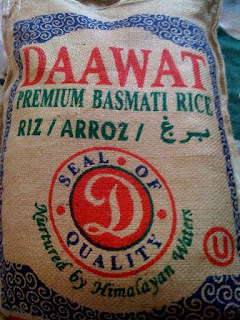 We use Basmati rice and buy Daawat brand from Costco. A bag like this usually lasts us for about a month & a half. Start with 3 1/2 cups of dry rice from the bag. 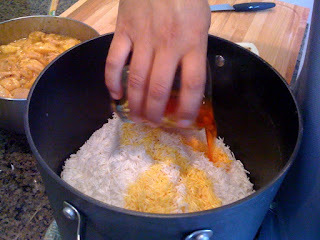 Pour the 3 1/2 cups of rice into a large pot or Dutch oven. 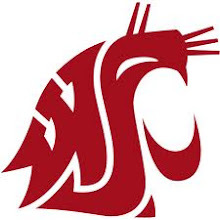 **It's best to use a Teflon or nonstick pot. This will ensure that you have a crunchy bottom (tahdeeg) on your rice *(see below for more about tahdeeg). 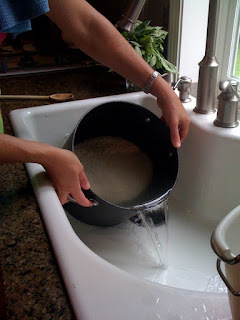 Fill the pot with enough water to cover the rice. 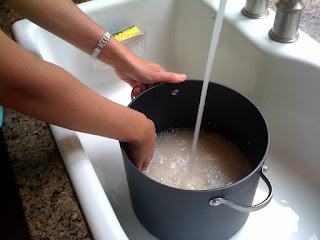 Gently mix the rice and water with your hands. The goal is to wash off dirt, starch, etc. Pour off the milky water. Fill your pot, wash the rice and pour off the water again. Do this until the water is almost clear. It will probably take between 6-10 rinses to get the water this clear. 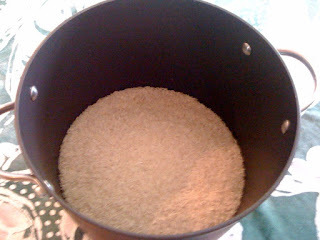 Next, fill a wooden spoon (not overflowing) with salt and pour into the rice & water. The rice will need 3 wooden spoonfuls of salt. Stir the salt into the rice. Place the pot on the stove (high). Bring the rice to a boil. 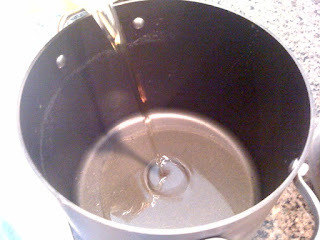 Stir the water occasionally to make sure no grains stick to the bottom. Boil for 5-6 minutes. Test a few grains to make sure they are done. 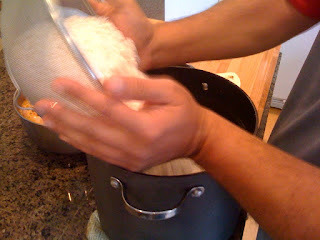 You will know the rice is DONE when it is a little soft and a little hard - between these two points. If the rice is soft, it is overcooked. If the rice is still crunchy, it's not done yet. Immediately drain the rice into a colander. 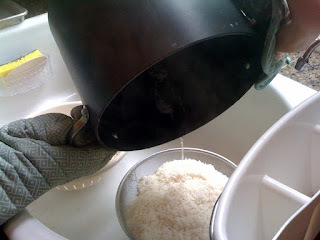 Fill the pot with 2-3 cups lukewarm water and rinse the rice one time. Let the rice drain for a few minutes. 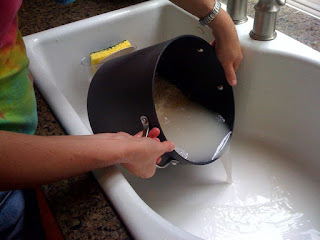 Gently tilt the colander to the sides to drain off any extra water. 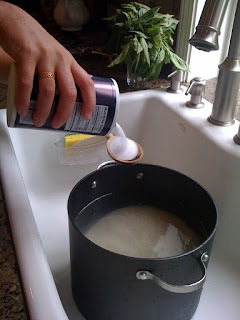 Pour vegetable oil into the bottom of the same pot you boiled the rice in. It should just cover the bottom (1/2 to 3/4 cup). Place a flour tortilla in the bottom. You may need to trim some off an extra tortilla to completely cover the bottom. This is called tahdeeg. 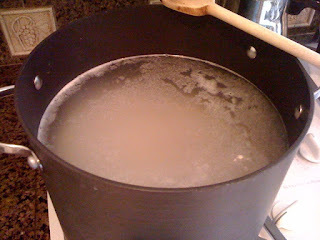 Tahdeeg means "bottom of the pot." **NOTE: You can also slice a potato and place it on the bottom as well. My family prefers the tortilla. 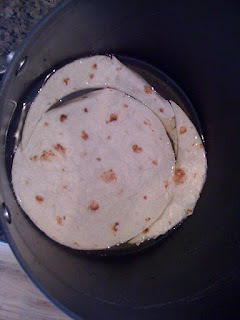 If you do use tortillas, make sure you only use one single layer. Any more and the steam can't get through to cook the rice. Pour the rice over the tortilla. It's best to try and shape the rice into a pyramid in the pot. The rice should not be level. It's easier to spoon the rice (rather than pour) into a pyramid shape. If you have some saffron, grind up 1 teaspoon. 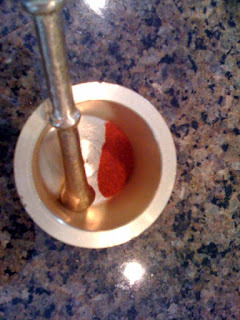 Mix the saffron into 1/2 cup boiling water. 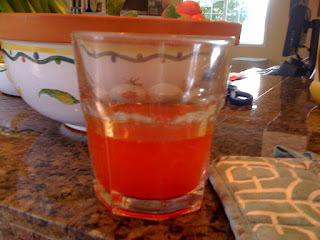 If you don't have saffron, you can just use 1/2 cup lukewarm water. 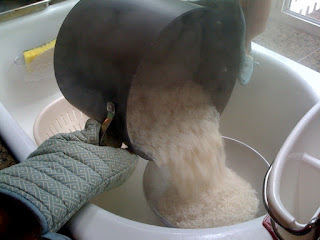 The liquid is needed to steam the rice. 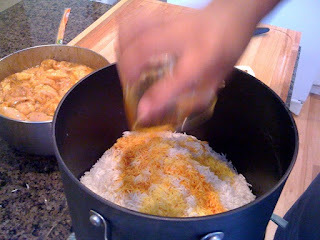 Pour the saffron water equally over the rice. Make sure to use every last drop. Cover and cook over medium heat for 15 minutes. 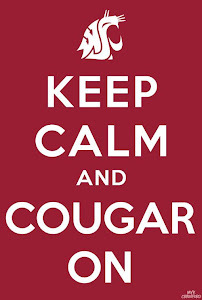 Turn the heat down to low and cook for about 45 more minutes. Remove the pot from the heat. Spoon out the rice onto a platter and serve. Carefully take out the tahdeeg with a spoon or invert onto a plate. What's left of the tahdeeg. Crispy-crunchy goodness. I don't use minute rice, but that's a far stretch from the long grain I use. 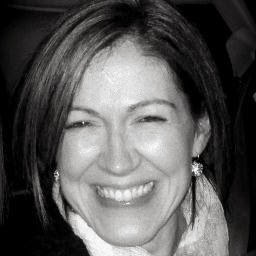 Erin, plug your ears . . .. I can't bring myself to like Saffron.